In about 1982 (and for most of his working life), my Dad worked at Thames TV, and was a member of the computer club there. Dad and his fellow club-members foresaw the increasing importance of computers in the workplace, and petitioned the management to provide subsidised computers for their staff to take home and learn on (I remember being kept regularly updated on the progress of these negotiations, excited at the prospect of swapping my rather worn 16k Sinclair computer for a spiffy new 32k BBC Model B). Eventually the management were persuaded, and Thames staff were offered a free three-year loan of a BBC Micro. I played games on it, of course, many of them (I still remember the first night after we got it: Pacman was so burnt into my visual cortex that he continued to chase around my brain all night). But I also wrote games: typing in code from magazines and inventing small programs of my own. I even, along with my schoolfriend David Swaddle, set up a software company DSoft (which took its name from our shared initials). That never went very far (although bunking off school to hawk vapourware to all the local computer shops was kind of fun), but it was a start to something. At around the age of 16, I started to lose interest in computers. There were too many other things in life to grab my attention. But when I came to write my university dissertation five years later, my dad had just got a new PC, so I laid claim to the old BBC (which had been sold on to us by Thames for a nominal amount once the three-year loan was up) and used it for essays and revision notes. It took a few more years to rediscover programming: in fact, I was working for Olivetti, writing letters to debtors, when one day I looked at the computer I was typing on and thought “hey, I used to program these things when I was a kid. It was a lot more fun than this, and I bet I could get paid more money for doing it”. I went back to college to study C & C++, and never looked back. 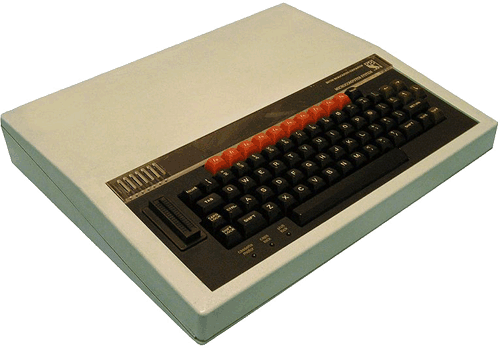 So eventually I’ve pitched up working at the BBC, and I guess (like many in BBC “Future Media & Technology”) you could say it was the BBC Micro which got me here. But, unlike many, it was an ITV company which had the foresight to give me that micro, and plant a seed which continues to bear fruit. I can’t imagine many companies being quite so forward-thinking nowadays, especially as in the intervening years all companies, private and public, have been “rationalised” to the extent where such costs are impossible to justify to shareholders/tax-payers. And I think that’s a very sad thing. 10 PRINT I miss the old BBC Micro, although the sound of the tapes still haunts me. We used to have a Micro B at home, and a lesser model at school – it still amuses me that back in those days there used to be 20 or so kids all sat, horseshoe chair arrangement, round a screen – and in my last year of primary school a similar arrangement hanging round a 386 that’d been donated to us by Avesta Sheffield. For my first two or three years at secondary school, we only had one machine between approx. 1,000 pupils (a Research Machines). Us “computer club” members used to take turns every lunchtime to sit in the office and type in programs. I did type that in the comment above originally, it still amuses me to this day! I’m kicking around ideas for a BBCMicro for the 21st century, and i think your tale chimes with a few of the key elements I’m trying to get to grips with. Can you recall, or possibly could your dad recall, how those negotiatios with the Thames management went? What were the killer arguments used to get investment made? I’m also intrigued by the computer club issue- back then clubs were rife- that was how we structured our pastimes, with clubs and societies. For many myriad reasons clubs these days are far less popular, but something like the old club ‘grass roots’ network is I think essential in making an impact in technical education for all ages. Right now I’m really interested in Hackerspaces- don’t suppose there’s any up Sheffield way? They say “Practice makes perfect”, I don’t doubt it. Many things we need to try. It’s en interesting. Air Force Ones. Another company which had such foresight was GEC. They subsidised (or had a negotiated deal with Acorn) BBC micros to employees for £300 instead of £400. My dad buoght one this way, along with a number of colleagues.